Our range of products include vial powder filling machine, injectable powder filling machine, dry syrup powder filling machine, powder filling machine for pharmaceutical industry, double head augur type syrup powder filling machine and automatic rotary dry syrup powder filling machine. 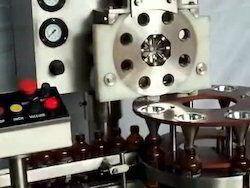 We are manufacturing Sterile Powder Filling Machine for Vials with the output speed of 120 Vials Per Minute. This machine is having an output speed of 120 Vials Per Minute in Single Doze. We have supplied this machine to South African Countries, IRAN, Turkey, Jordan, South East Asian Countries and Pakistan. Please do contact us for further information about our products. Automatic Injectable Sterile Powder Filling Machine with Rubber Stoppering Machine we are manufacturing with advanced features and automation. We have exported this machine to Middle East countries African Countries and South African Countries. We would like to request you to kindly let us know for further technical description. Our commitment to maintaining the quality standards can easily be seen in the mechanism of the Dry Syrup Powder Filling Machine. This durable machine is used to fill dry syrup powder quickly and easily. Made out of finest grade material, sourced from our reputed vendors, this machine comes with a promise to ensure durability and performance in the long run. Powder Filling Machine for Pharmaceutical Industry with Rubber Stoppering Machine we are manufacturing with advanced features and automation. We have exported this machine to Middle East countries African Countries and South African Countries. We would like to request you to kindly let us know for further technical description. An excellent output of this Double Head Augur Type Syrup Powder Filling Machine is an example of our commitment to maintaining the quality standards. Ideal to be used for larger volumes, this machine eliminates wastage and provides a total value for money deal. With the increased production demand, we have designed this machine to make the powder filling process quick and accurate. One of the premium quality machinery that we export across the globe includes the Automatic Rotary Dry Syrup Powder Filling Machine. Highest quality of a material is used in this machine, which makes the process of filling dry syrup powder quick and hassle-free. 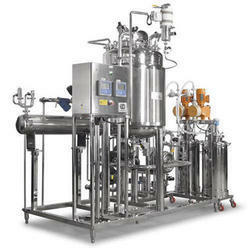 Comes with the fully automatic mechanism the machine is ideal to be used in pharmaceutical and cosmetics industries. 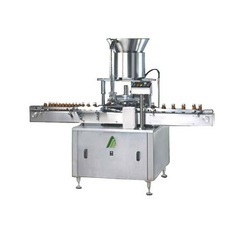 We are the leading manufacturers in the global market that has successfully designed this fully Automatic Single Head Dry Syrup Powder Filling Machine. The uniform feeding machinery is very efficient as it has been exported in a huge quantity to the European countries. 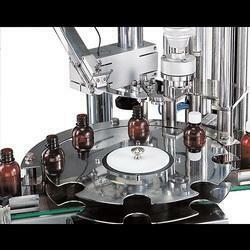 Ideal for pharmaceutical industry, this machine is widely used in the cosmetics industry as well. We are manufacturing Automatic Injectable Vial Powder Filling Machine having an output speed of 120 VPM AND 240 VPM having features like servo based filling technology as well as Vaccum Stoppering. We would like to request you to kindly contact us for further technical description. 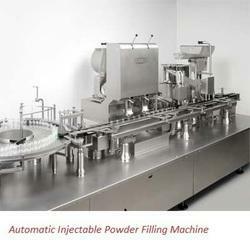 Looking for Powder Filling Machine for Pharmaceutical Industry ?